70fr 14 Sep 77 Chelonia mydas Adult swimming left underwater. 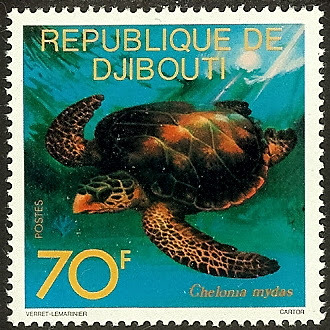 200fr 11 Nov 92 Caretta caretta Adult swimming left underwater. 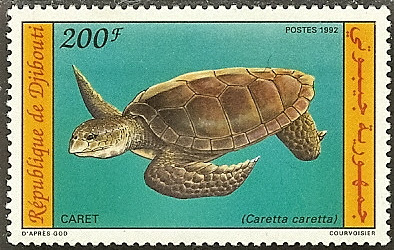 Stamp inscribed "caret". 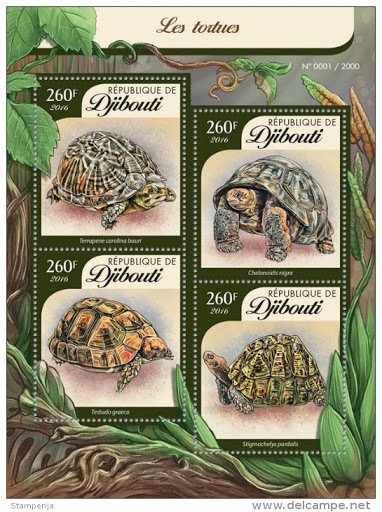 SC 760 60f 17 Jan 97 Unidentified Tortoise Single stamp from se-tenant strip of three. Shows tortoise and fox starting race. Legend adapted from Aesop's "Tortoise and Hare". SC 761 60f 17 Jan 97 Unidentified Tortoise Single stamp from se-tenant strip of three. Shows tortoise on road. Legend adapted from Aesop's "Tortoise and Hare". SC 762 60f 17 Jan 97 Unidentified Tortoise Single stamp from se-tenant strip of three. Shows fox sleeping in shade while tortoise goes ahead to win race. Legend adapted from Aesop's "Tortoise and Hare". 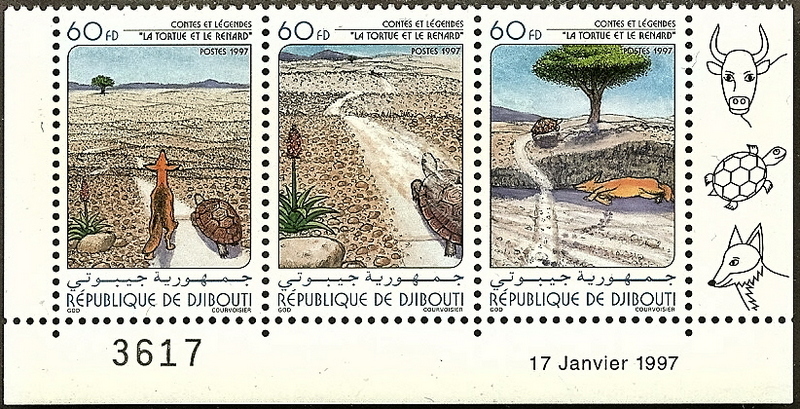 SC 762 a 60f 17 Jan 97 Unidentified Tortoise Se-tenant strip of three stamps w/ scenes from legend "The Tortoise and the Fox". 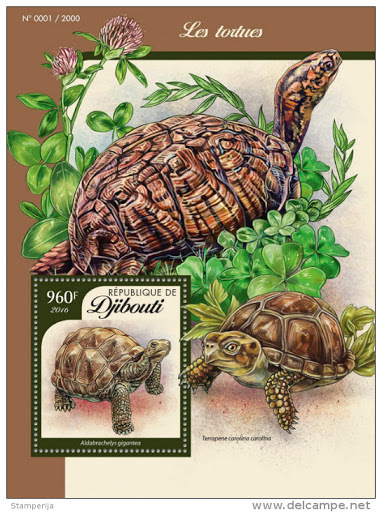 Drawing of tortoise in selvedge of strip as well as on all three stamps. Legend adapted from Aesop's "Tortoise and Hare". 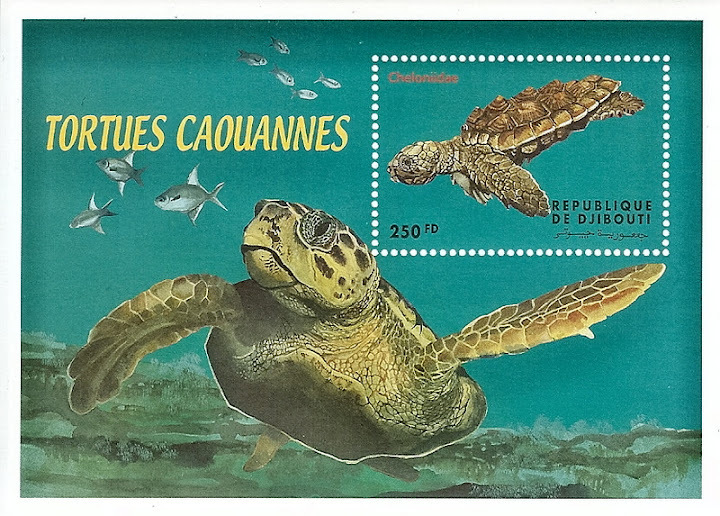 250f 14 May 00 Caretta caretta Small sheet w/ loggerhead turtles both on the stamp and on the selvedge. Sheet inscribed "Tortues Caouannes".